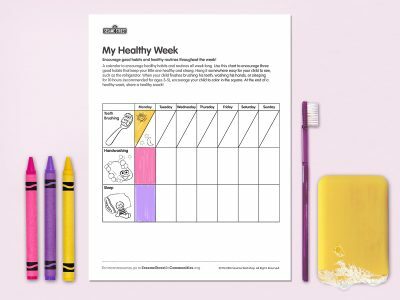 The Big Idea: Encourage good habits and healthy routines for children all week long! Use this chart to encourage three good hygiene habits that keep little ones healthy and strong. Hang it somewhere kids can easily see, such as the refrigerator. When your kids finish brushing their teeth, washing hands, or sleeping for 10 hours (recommended for ages 3–5), encourage them to color in the square. At the end of a healthy week, share a healthy snack!